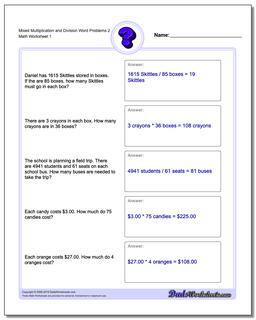 Description Mixed Multiplication and Division Word Problems 2: This worksheets combine basic multiplication and division word problems. The division problems do not include remainders. These worksheets require the students to differentiate between the phrasing of a story problem that requires multiplication versus one that requires division to reach the answer.